And our winner is ... Jennifer Earley ! Congratulations to you Jenn, and merry Christmas. Send me your mailing address using the contact form on the left column ans I will send you your prize ASAP ! Thank you all for your support during this past month, I hope you will continue to visit my blog next year. Your interest is my motivation to blog ! Merry Christmas and best wishes to all ! It's a quick and easy one, uding black paper for the base, a stripes rectangles, the holly border and a tag hand cut from the journaling sheet of the North Pole Gazette pad (Recollections / Craft Smith). After all of these 30 cards, I still have 17 sheets of paper from this paper pad ! 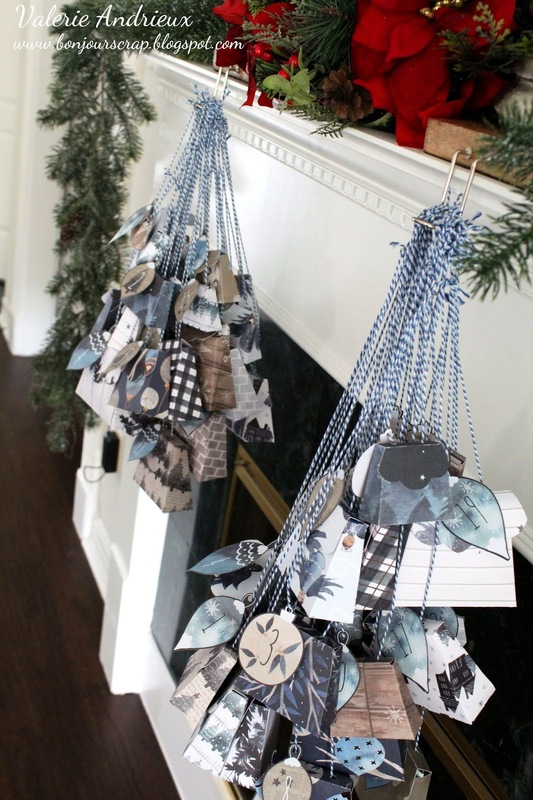 Enough to cover Holidays scrapbooking pages, or a mini, or more cards ! For $5, it was a good investment for cardmaking ! 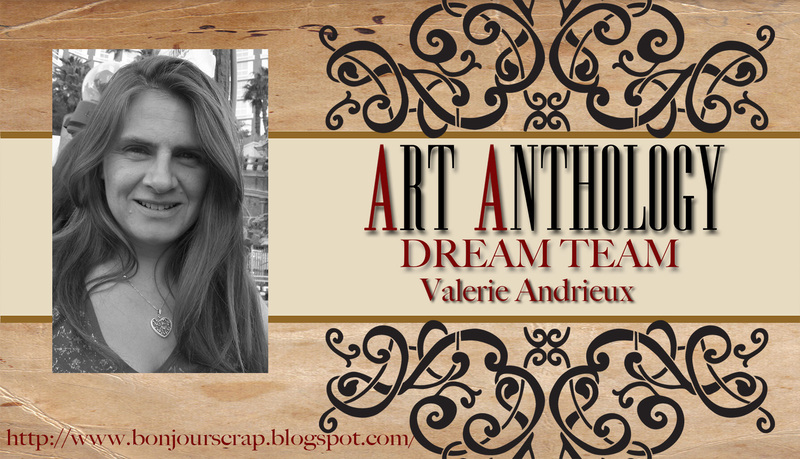 It is the last opportunity to enter my giveaway too ! You have 30 chances to enter by commenting on my 30 cards. One comment is enough to enter, but the more you comment, the more chances you'll have ! Giveaway is closing tonight at 12PM CST and winner will be announced tomorrow. Will you received a Christmas prize form me ? Good luck to everyone, and overall have a wonderful Christmas Eve ! See you tomorrow for the result ! The cad base was made with the black and silver stripes paper, kraftsnowfles on the front, and green pine branches paper cut with the stitched rectangle die I used a lot these previous days... I just outlined the stitches with a black pen. Then I place vertically the kraft/Green stripes border and added a fine stripe of journal paper in the center. Journaling tag cut from the tag sheet on the top and the card was done ! You have today and tomorrow to comment on my cards (not only these two but the previous ones too !) to enter my 30 cards before Christmas giveaway ! Don't let the Christmas prize slip away ! 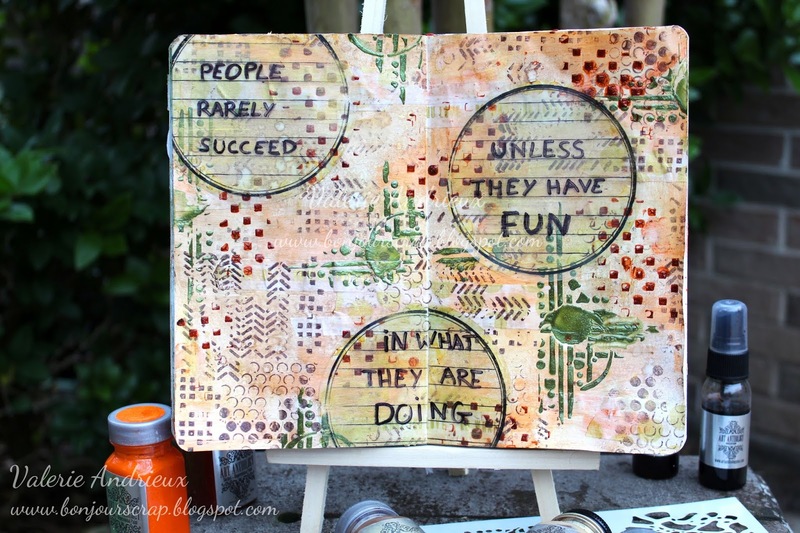 Background is built with stencils, inks, paints and fine pen. 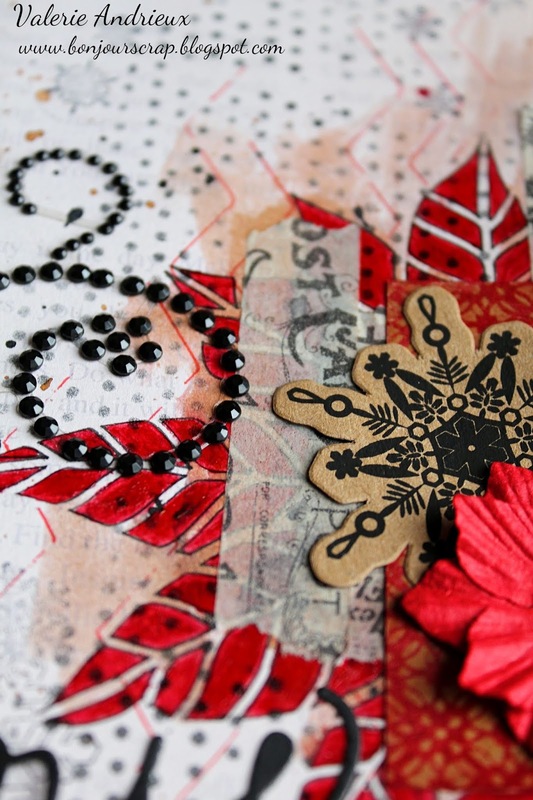 I drew the poinsettias with an old Dreamweaver metal stencil and a black pen, and then paint it with the Ruby Red Shine medium by Art Anthology. I also use a red pen with the Chevron stencil and black ink pad with the Dot Matrix stencil, before adding ink in brown Warm and black Raider with a brush. 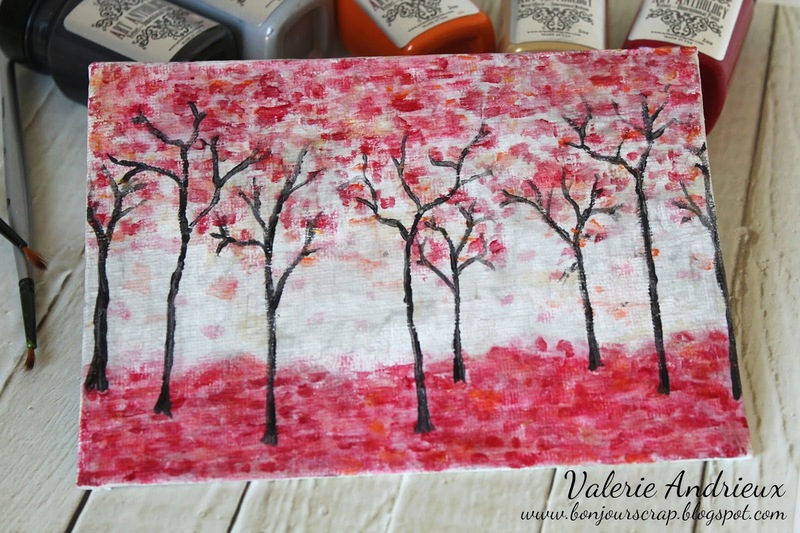 I also splattered brown, black and red ink (Indulgence Minx) over the page. I re-colored the kraft paper (DCWV) with the Ruby Red Shine. 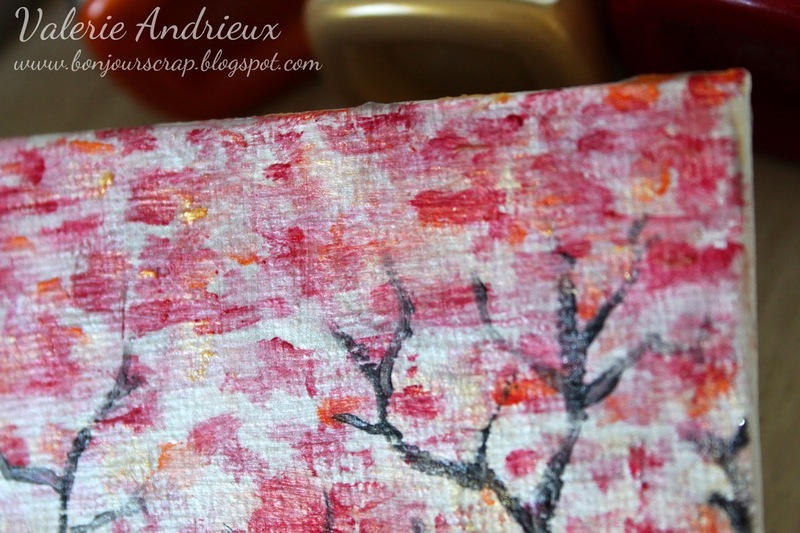 It is an ink resist paper, so the color revealed the pattern of the paper. What else can you spot on this page ? 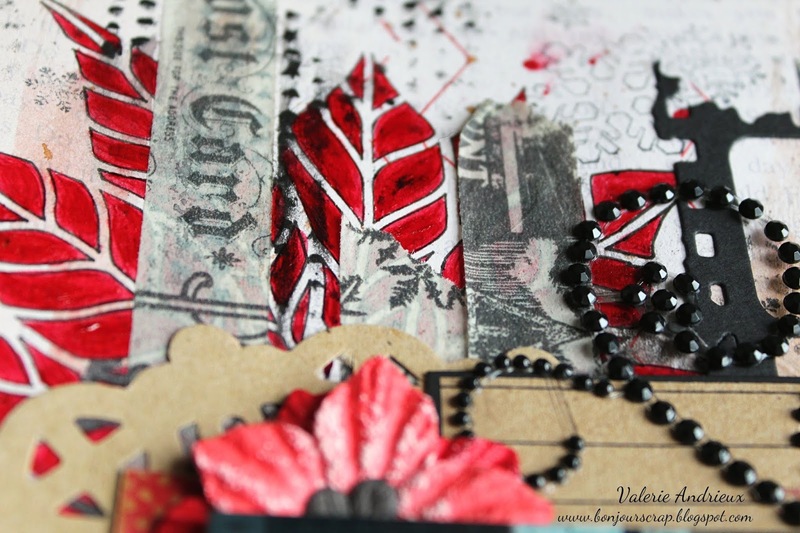 Tissue tapes (Tim Holtz), black bling, kraft embellishments (Maya Road), red and black flowers (Prima Marketing) and two die cuts (one negative strip and the title). 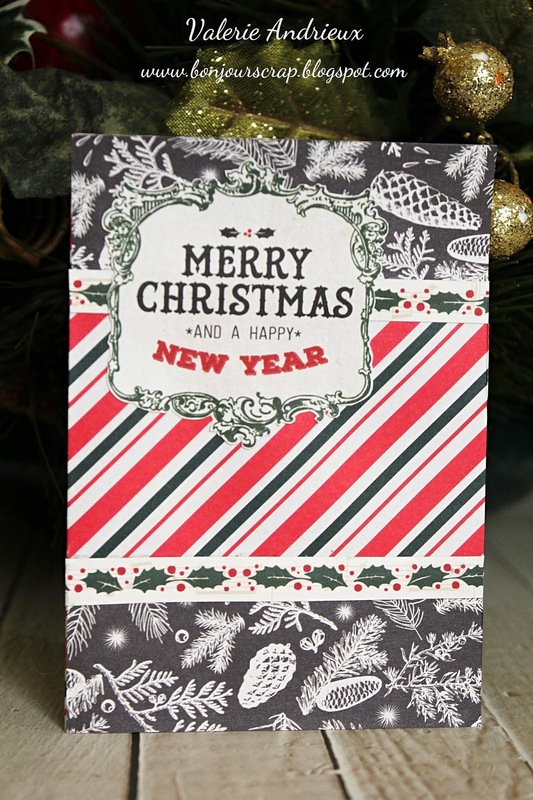 Thank for your time, see you later today for another Christmas card (my giveaway is still running...) ! After cutting the red plaid panel with the largest die of the set (double stitched rectangle by Cottage cutz), I created 3 smaller opening with the smallest die of the set. I outlined the stitches with a white gel pen, and place 3D foam adhesive squares on the back of the red panel. 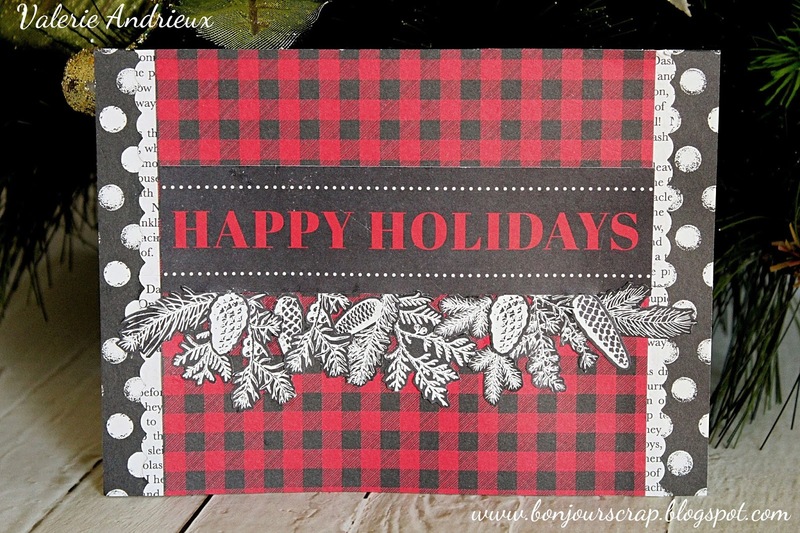 I glued a piece of black paper with white pine branch on the card base and under the red paper, and added a small tag cut from a journaling sheet. 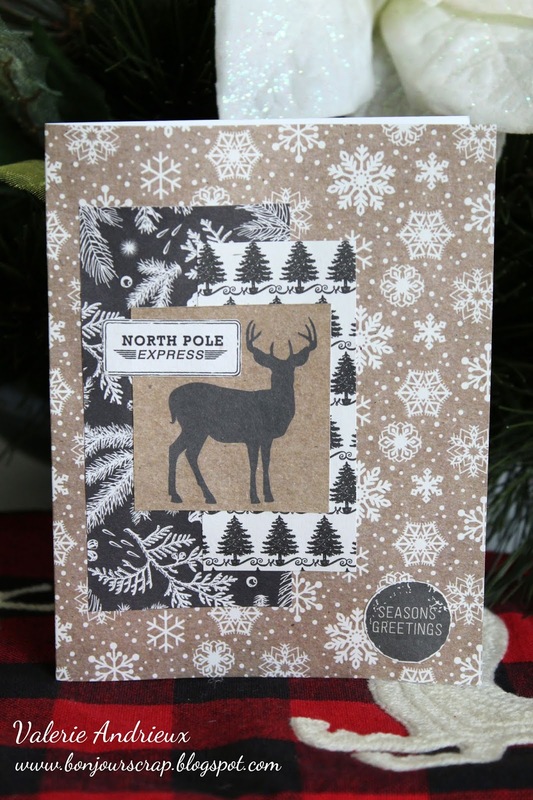 All of the papers came from the North Pole Gazette paper pad (Recollections / Craft Smith). That was my card n.23. 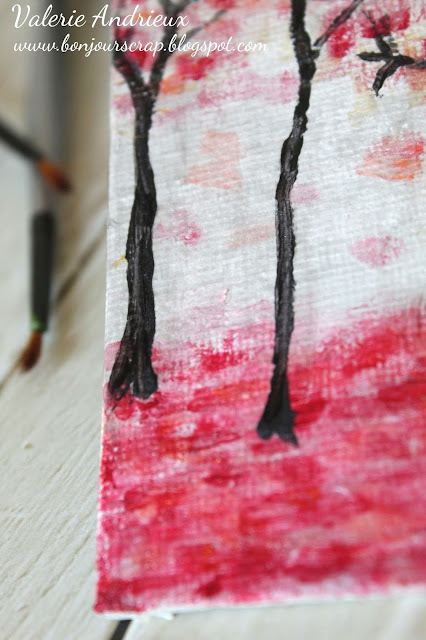 7 more to go... Hope you already commented on the 22 others to enter my giveaway ! 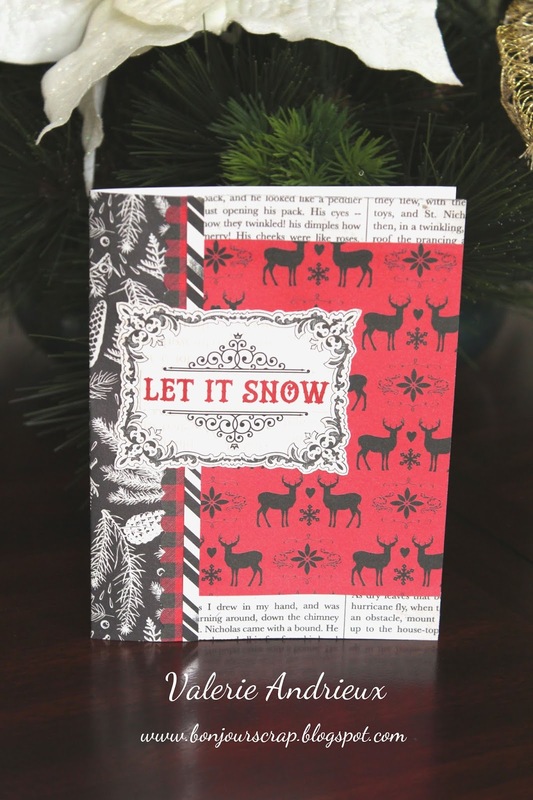 The red glitter with white snowflakes from the North Pole Gazette (Recollections) is the base of this card. The tag and plaid paper are one element cut from a tag sheet, sentiment tag from another one. The central snowflake came from the same paper than the base, and by chance the snowflake die (Little B.) that I had fit perfectly one of the snowflakes on this paper ! 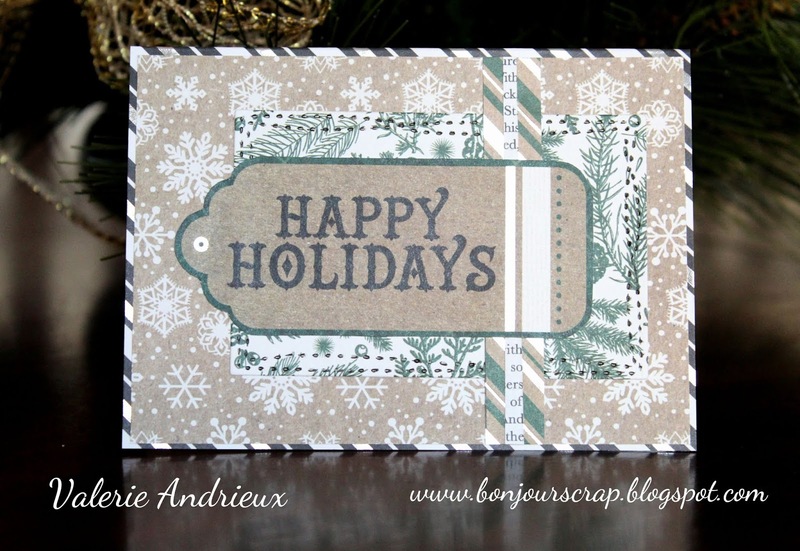 Both the sentiment tag and the snowflake are mounted on 3D foam adhesives. Thank for your time reviewing this post. Don't forget to comment to enter my giveaway. 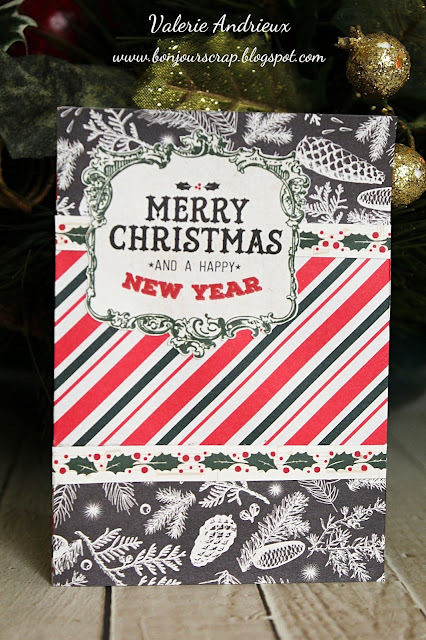 And see you tomorrow for another Christmas card ! 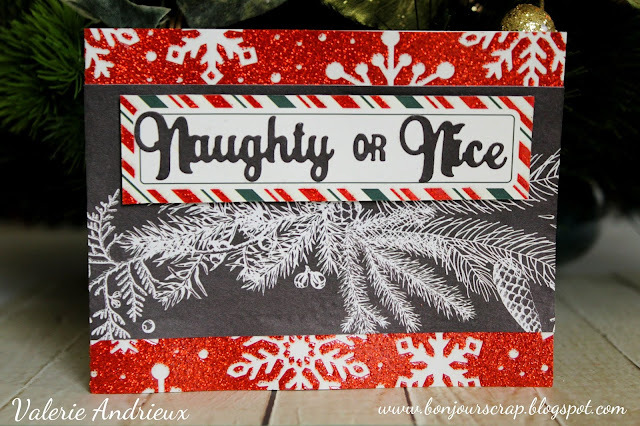 I added the black paper (from a huge wreath sheet of North Pole Gazette pad) in the front center, a tag from another paper and sentiment cut with the Naughty or Nice set by Spellbinders. Nothing fancy but a fun card to make. That makes card n.19. You should have made 19 comments on my Christmas cards by now, haven't you ? 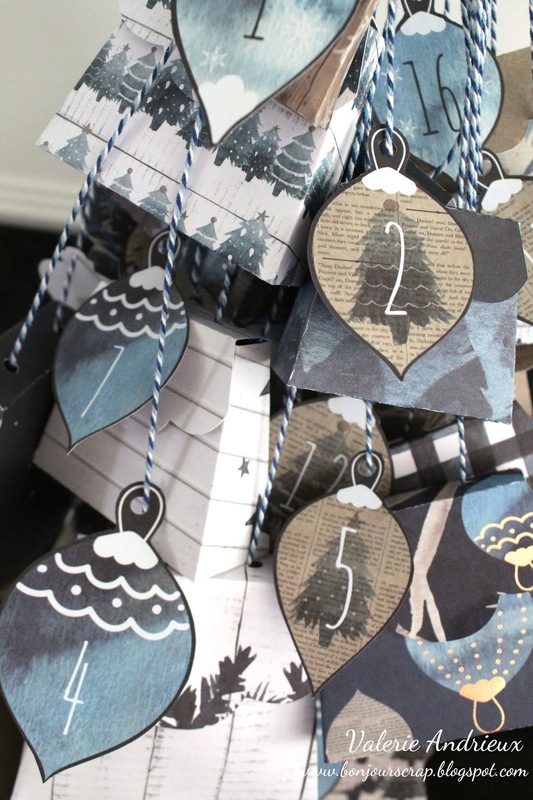 It could be 19 chances to win my Christmas prize ! What are you waiting for ? 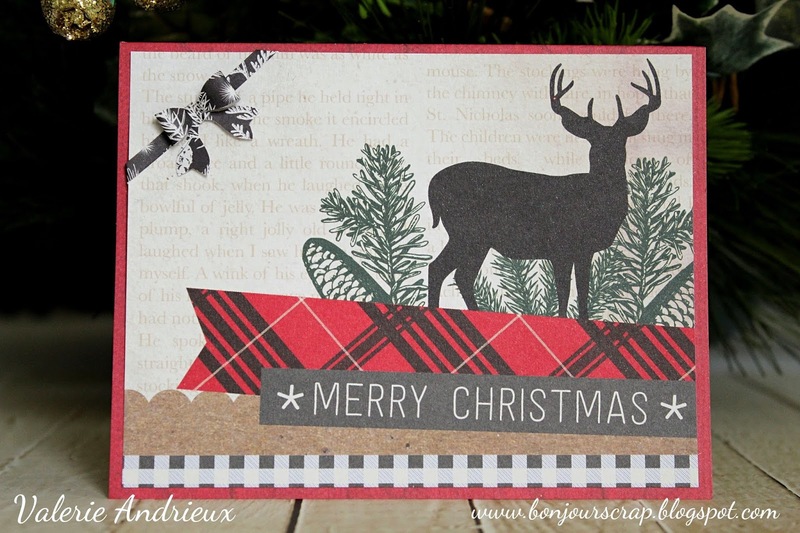 I just made the card base with red paper, cut out the rectangle with borders, pine branches and deer to fit the card, and add a 3D punched bow (by Fiskars) to finish this look ! I'm back with a card made with 3 dies and 6 papers ! Base is a black/white plaid rectangle fold in half. 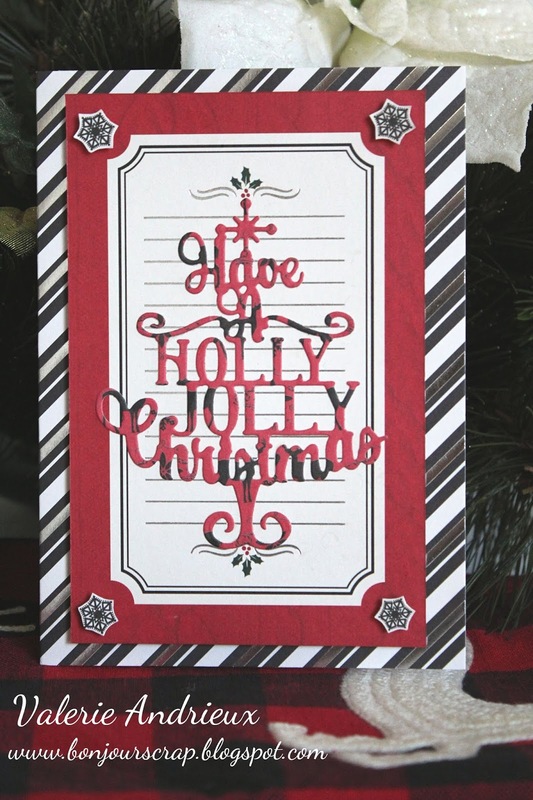 I used a journaling tag (with the holly in the corners), matted with candy stripes paper. I cut the red circle with a stitched die (Lawn Fawn), the tree shaped phrase with a Spellbinders die, and the wreath with a Little B die (cut 3 times). 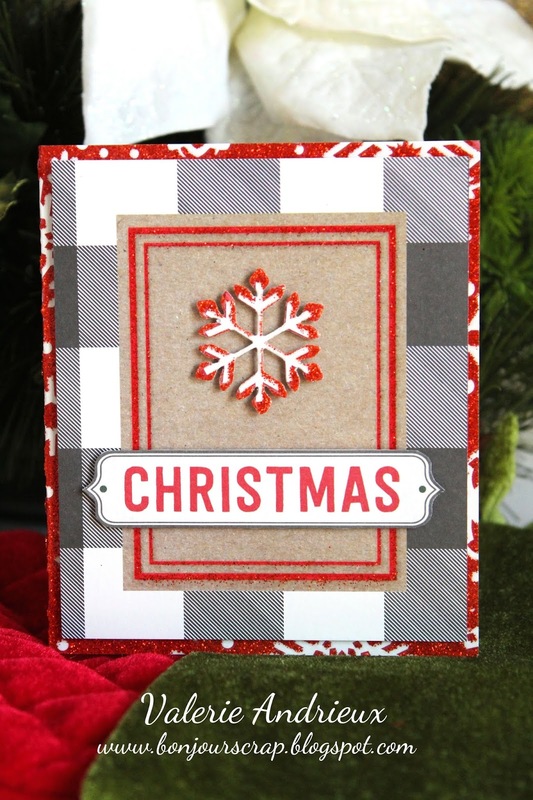 I assumed you like cardmaking... Sooo, don't miss the sale going on at Scrapbook.com, it's the last of their 12 Days of Christmas sale ! 12 great brands are on sale, you will find up to 50% off cardmaking products, and there is the last freebie, a Simple Stories Color Vibe 6x6 paper pad ! 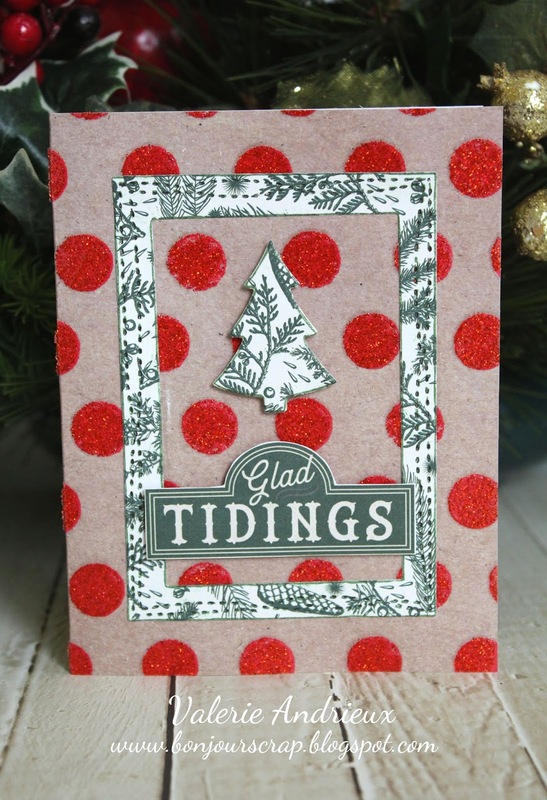 Thank you for your patience, and your love of Christmas card ! Have a great day and see you tomorrow ! This is my first card in French this year ! 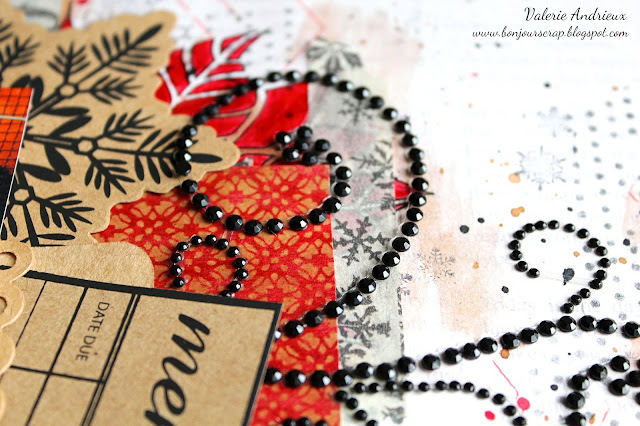 Red glitter and black, with a nice sentiment frame fussy cut. As for all my card this Christmas, I used papers from the pad (North Pole Gazette) to create the card base too. 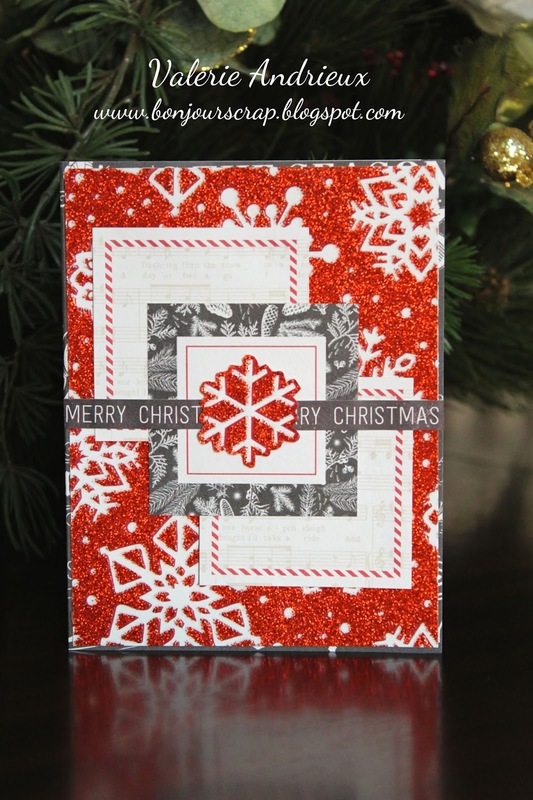 Here it's the red glitter with white snowflakes one, a 8 1/2" x 5 /12" rectangle folded in half. The strip of music paper is not from a music sheet paper, but from a detail of a journaling sheet. I cheated a little bit, because this music strip wasn't big enough to go from a side to another of the dots paper, so I just cut it and hide the hole behind the frame. Thnk you for stopping by for this 16th card. 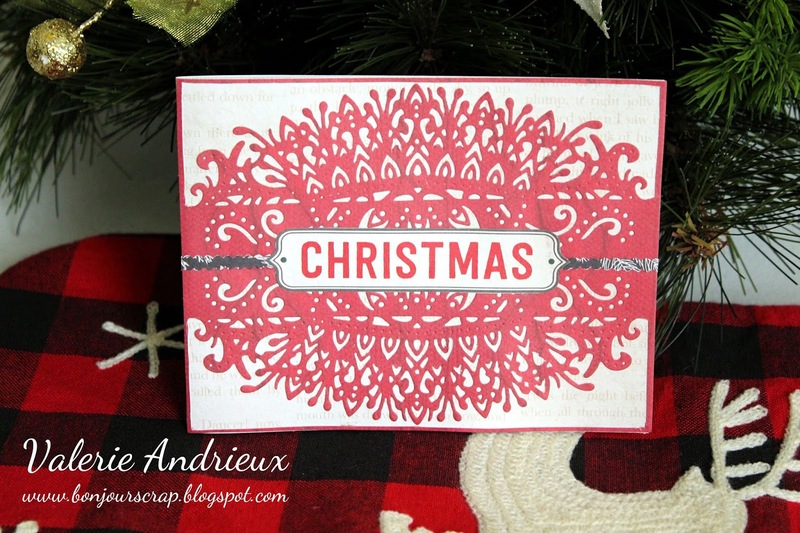 Don't forget to comment to enter my current giveaway, and see tomorrow for another Christmas card ! 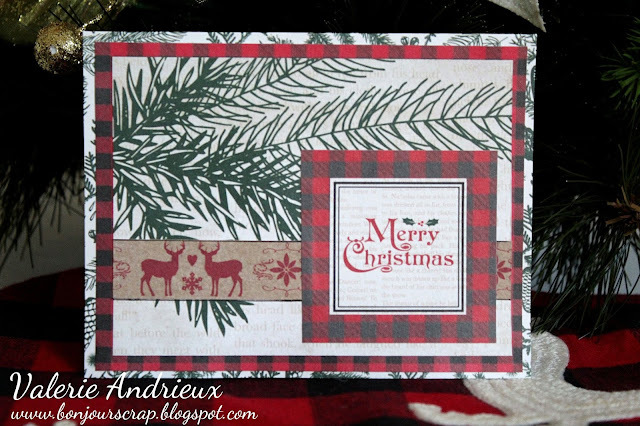 Base is a 5 1/2" x 8 1/2" rectangle cut in the red deer paper, folded in half. 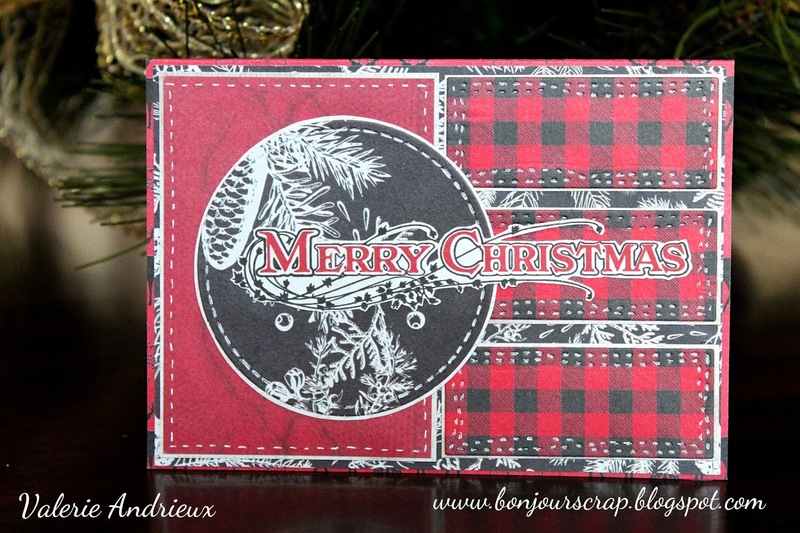 Creamy paper has already the plaid and kraft borders on its design, so I just cut a 4 1/4" x 5 1/4" rectangle in it, and applied the merry Christmas (shaped as a tree) cut in black paper. Base is a 5 1/2" x 8 1/2" black rectangle fold in half. 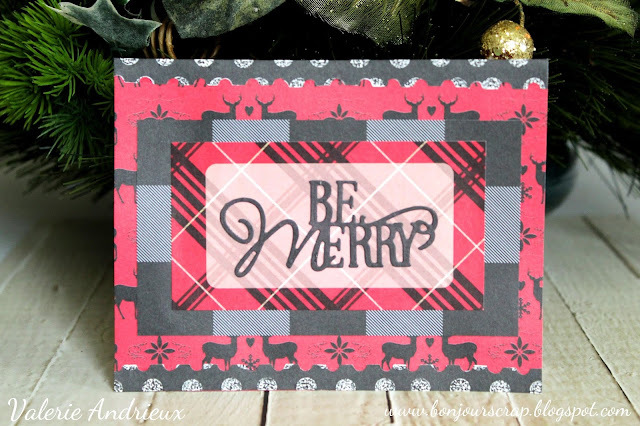 I added a 4 1/2" x 4 1/4" rectangle in plaid paper and the borders I found in the pad for the background. The square is a countdown tag and I masked the number with a red circle tag matted with another circle cut in black with a die (seal from the Hipster 1 set by Spellbinders). You could win a die cutting/embossing/stamping combo (see this post) by commenting on this card (or any other cards), so show me some love before leaving ! A black and red card with some plaid pattern today, and one die cut... That makes my 12th card before Christmas. 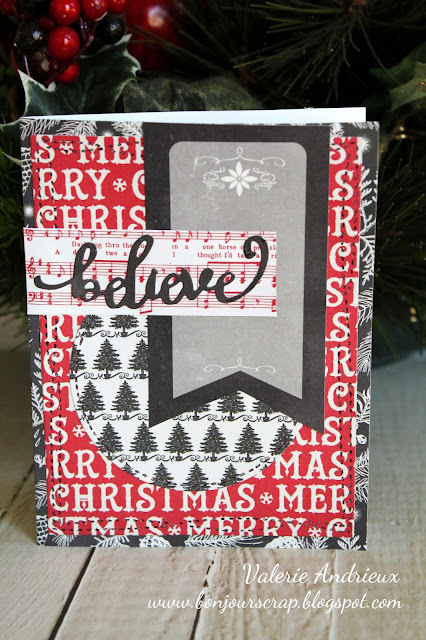 If you don't know it yet, I have a giveaway running and you could simply enter by commenting on my cards. It's 30 chances to win. Take a look at this post for details and prize. The base is in red deer paper, I added the black border with a decorative scissor, cut the red tag from one sheet, and mat it with the black plaid. 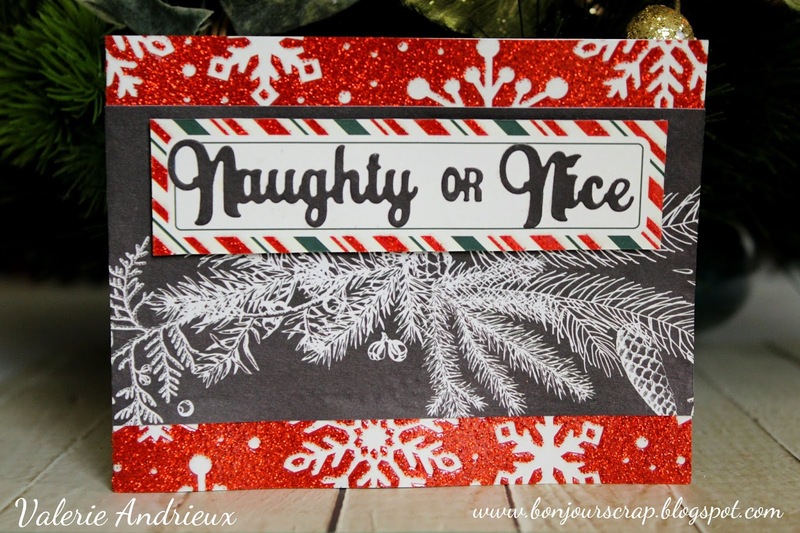 The sentiment is cut with a die from the Spellbinders Naughty or Nice set. 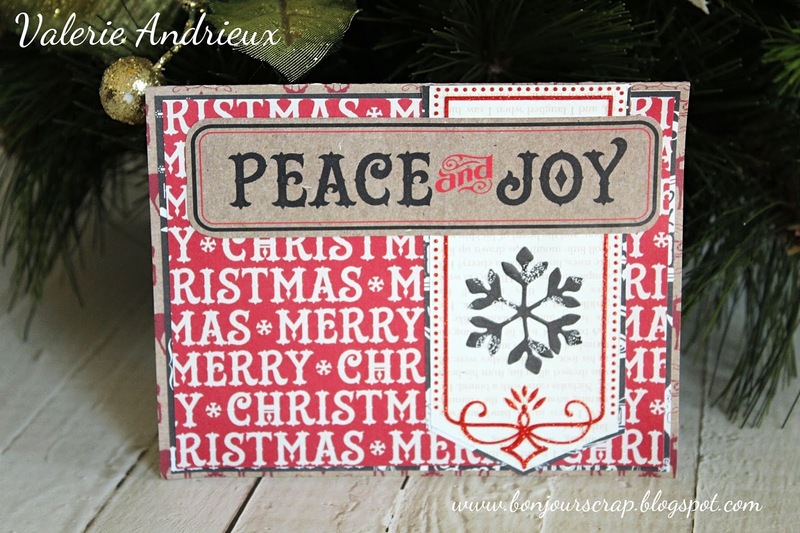 Dies are very useful to create cards, easy and quick to use but also inexpensive compare to stickers to create sentiment. 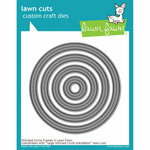 If you want to add some to your collection, Scrapbook.com has a great sale on die cutting : 20 to 50% off. 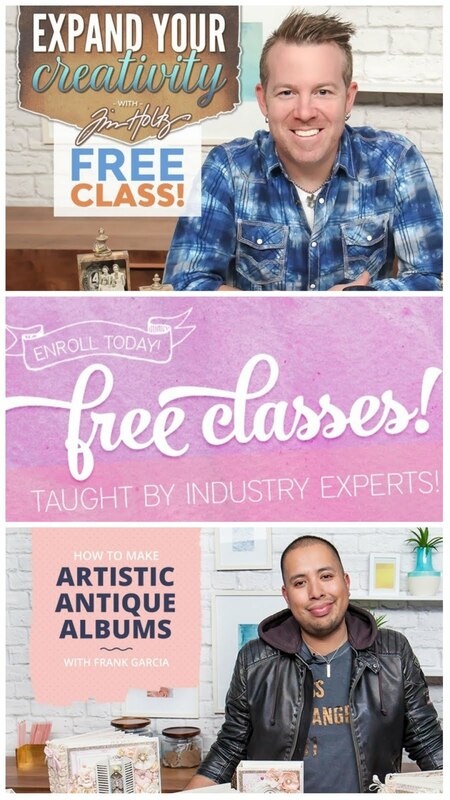 They also have 12 brands on sale like Sizzix, Tonic Studio, Prima, Lawn Fawn, We R Memory Keepers, Ranger, Doddlebug Design, American Crafts, Simple Stories, Echo Park, Photoplay Papers and Art Impressions ! 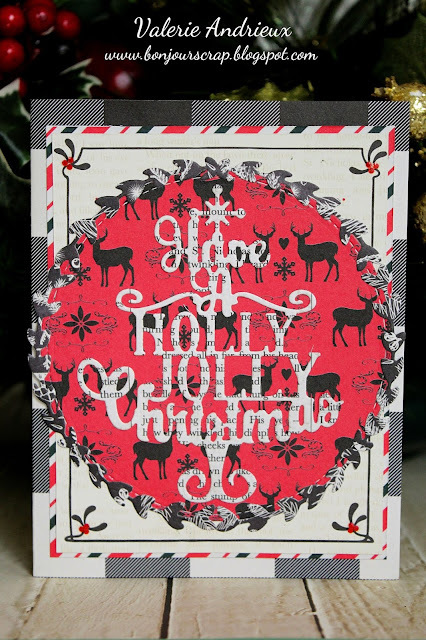 On the top of that, today's freebie is Tonic Dot N' Drop Die Paisley ! Base is a 5 1/2" x 8 1/2" rectangle fold in half. I cut the black frame from a journaling sheet from the pad (North Pole Gazette, Recollections), and the red frame from a sheet covered with Christmas saying. Both frame are mounted with 3D foam squares to give some dimension to the card. 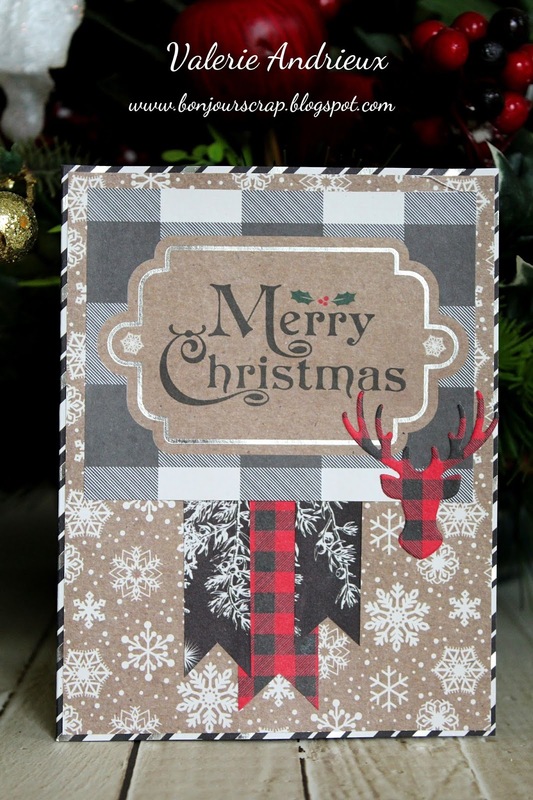 If you're looking for a good sale on scrapbooking or cardmaking stuff, Scrapbook.com has its 12 Days of Christmas sale going on. 12 hot brands on sale, 20% to 50% off Tim Holtz products today and a different freebie every day ! Today it's an Echo Park Spring Market Ephemera pack ! 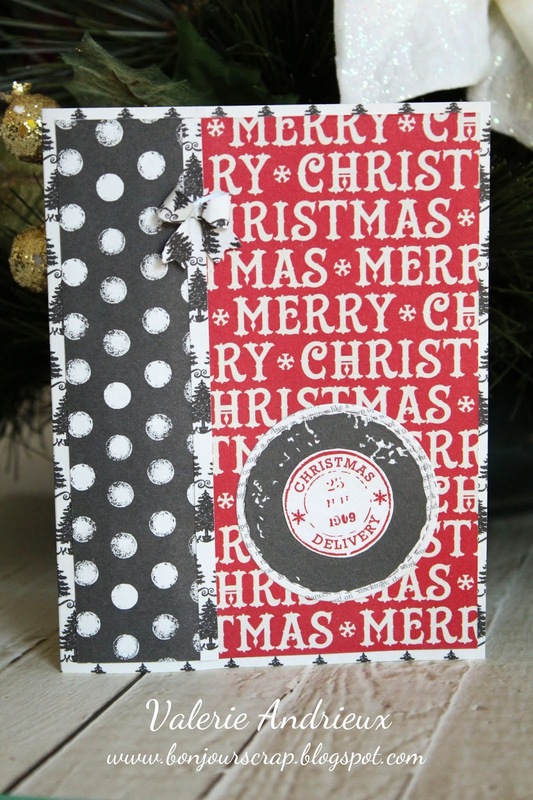 The Christmas delivery stamped image is hand cut but the black circle is not. 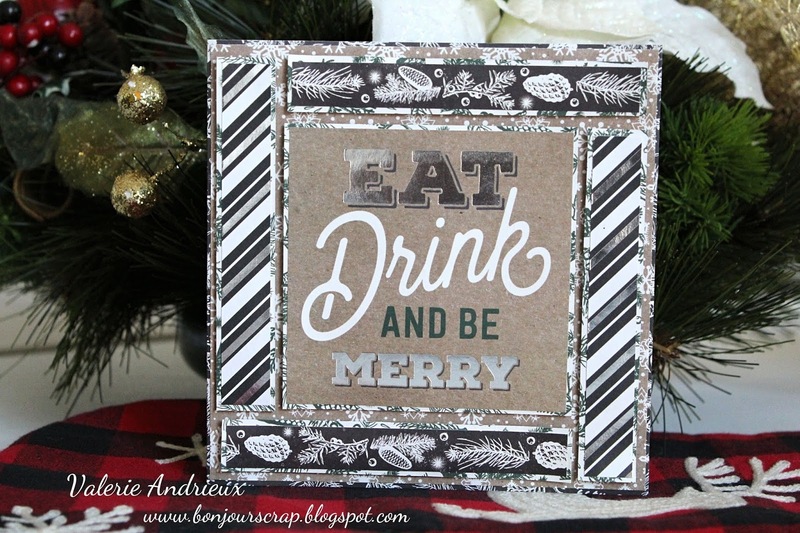 I used a stitched circle die by Lawn Fawn on one of the square countdown tag of the pad. 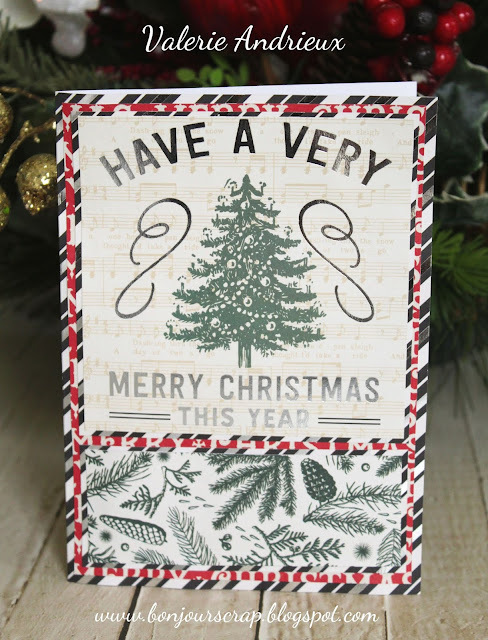 The punched bow add some nice dimension to this card. I made it with the Fiskars Bow tie punch. 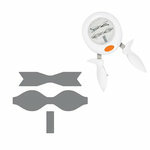 By the way, Fiskars has an incredible customer service. I used the punch once before the upper part was defective, so I contacted the customer service and they sent me a remplacement punch right away ! I received it in few days ! And so I can use them on my cards ! Don't forget to comment on this post (and on the others 2018 cards for more chance) to enter my giveaway. Have a nice Saturday and see you tomorrow ! The card base is a 10"x 7" silver and black rectangle fold in half. 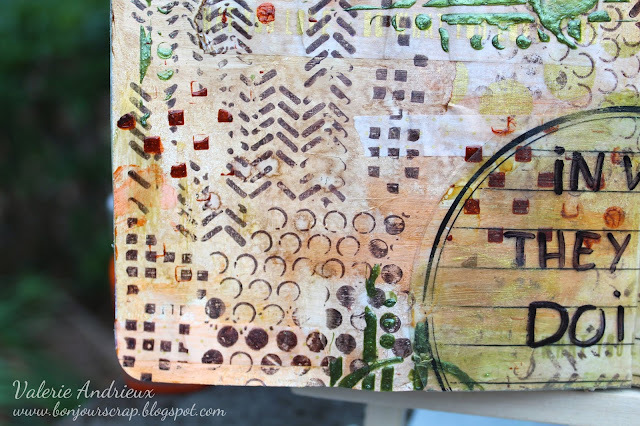 The tag matted with red is a journaling tag from the pad. I cut out 4 snowflakes that I placed on 3D adhesive foam on its corners. I found this die by Spellbinders lovely, this Christmas phrase in shape of a tree is really cute. 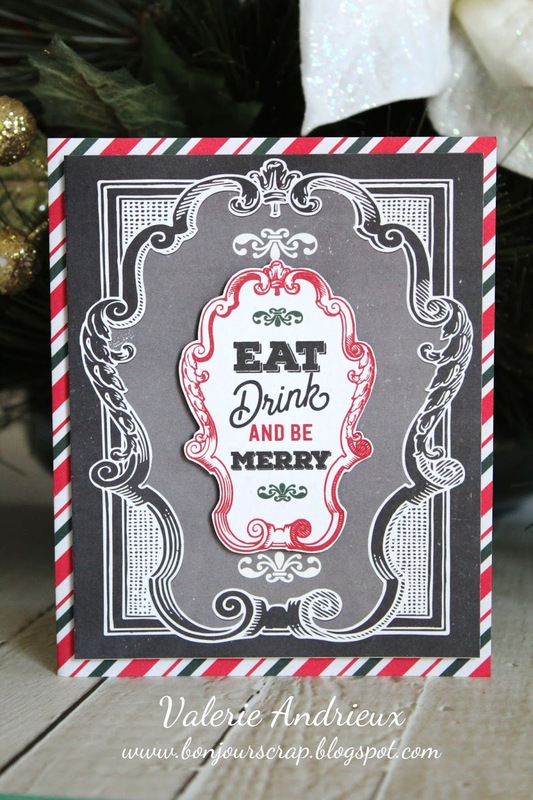 Let me remind you about my giveaway : 30 days, 30 cards before Christmas. Comment at least on one of them to enter the giveaway. The more cards you comment, the chance you have to win. Being a follower is not mandatory but really appreciated. Look at this post for details and prize. 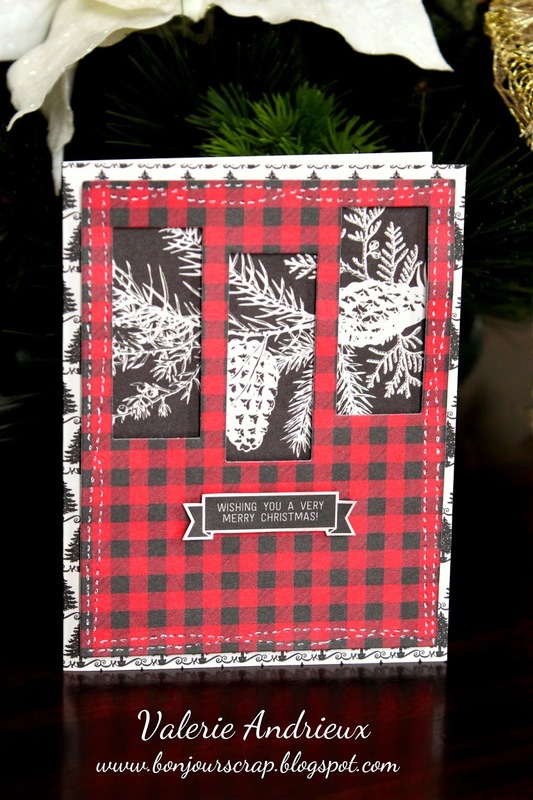 The card is cream, cut from the center of a sheet with design on two corners (the one with pine tree and deer from the North Pole Gazette by Recollections). The red part is one piece only : I cut a 4 1/4" x 5 1/2" rectangle and then run it twice with the die (once reverse) to have this design. I cut the tag from another sheet and use a left over from black paper to cut the small ribbon with decorative scissors. We are now at day 5, I hope you like my cards so far. Don't forget to comment if you want to enter my Christmas giveaway. Kraft and black again for this new Christmas card, but with silver this time ! 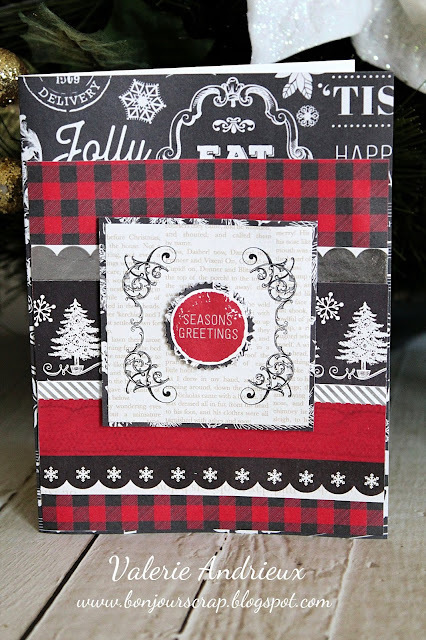 I use the sketch of a card I made for Fall sometimes ago, with a different sizing. 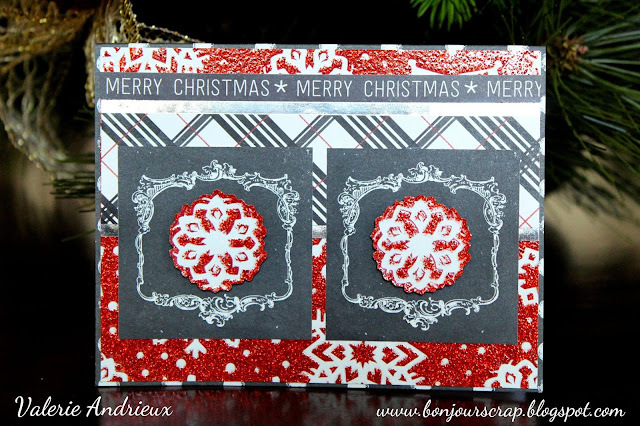 This is a 6x6 card with 6 different papers on it ! Something a little more traditional for this third card, with plaid, reindeer and pine tree ! Still no die or decorative scissors in this one, only my craft knife and glue. I just outlined the kraft border with a black pen to make it pop from the background. Base still is a 5 1/2" x 8 1/2" fold in half. 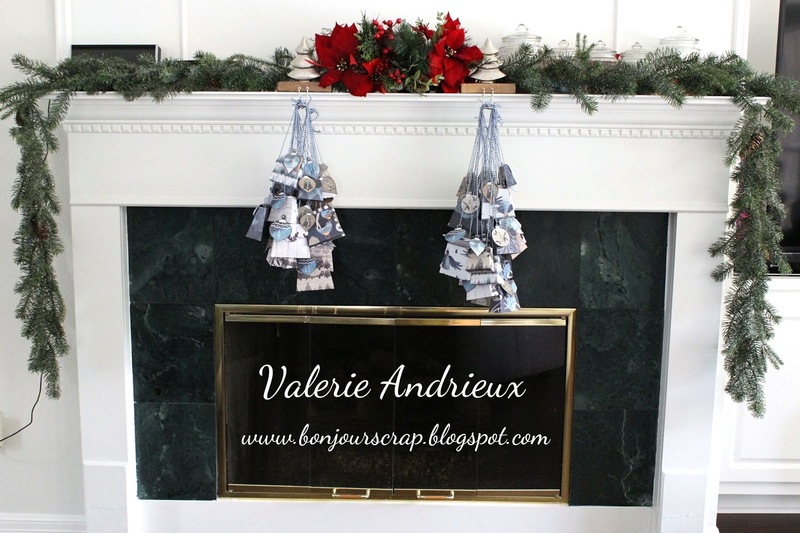 If you just arrived on this blog, there is a giveaway going on until the 24th of December. See this post for details. Don't forget to comment on one or more cards to enter it ! I couldn't resist to cut the cute believe banner to make it my sentiment. The red snowflake was a countdown tag and the small banner covered perfectly the number. 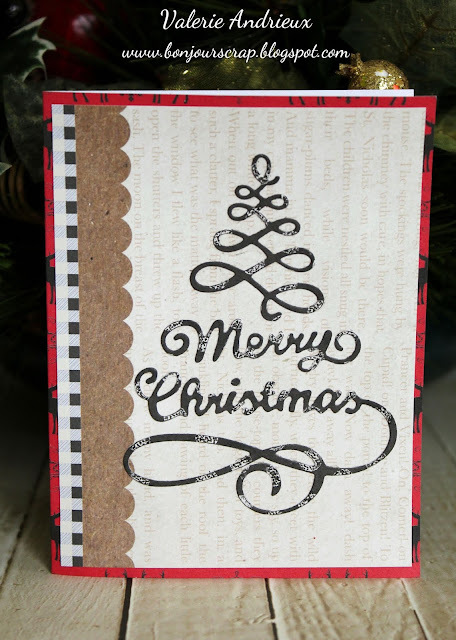 The base of the card is a 5 1/2" x 8 1/2" rectangle fold in half. 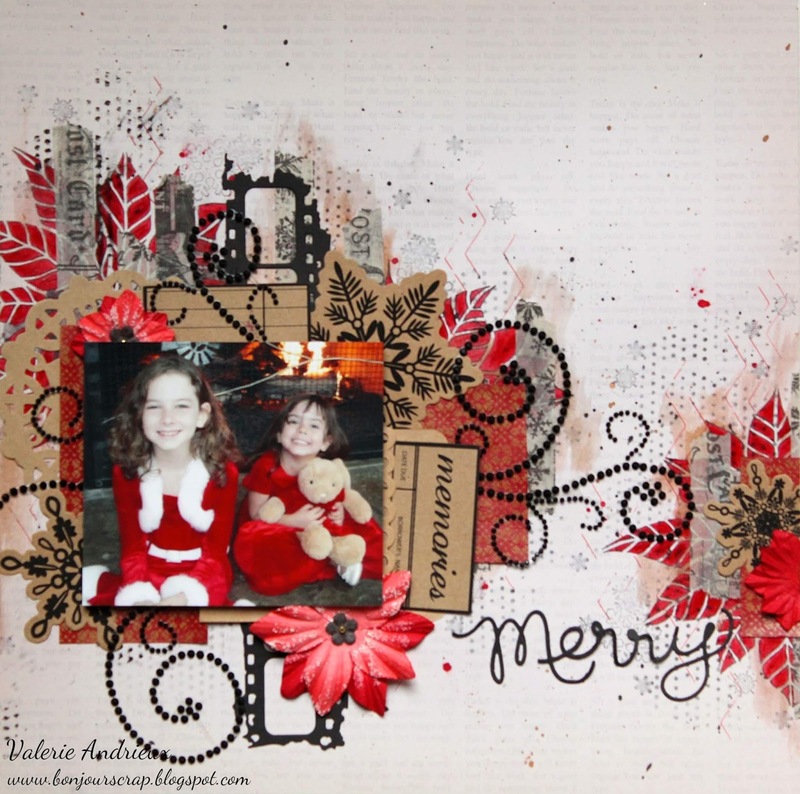 I just layered few other papers under the snowflakes. Don't forget to comment if you want to enter my giveaway. If you are looking for inspiration, take a look at my Christmas projects from the past years (see the tags on the top of the blog). There is no two alike project ! Thank you for stopping by today, hope to see you tomorrow too ! Every year is slightly different, so for 2018 I decided to use only ONE paper pad to create these 30 cards (no blank card!) ! The only tools I used were scissors of all kinds and dies, all already in my stash. I think everybody will agree that we prefer to keep our money for gifts than for cards... So I even go deeper in saving by using a paper pad I bought for $5 ! It's not a cheap one, good acid free cardstock with treatments and all... 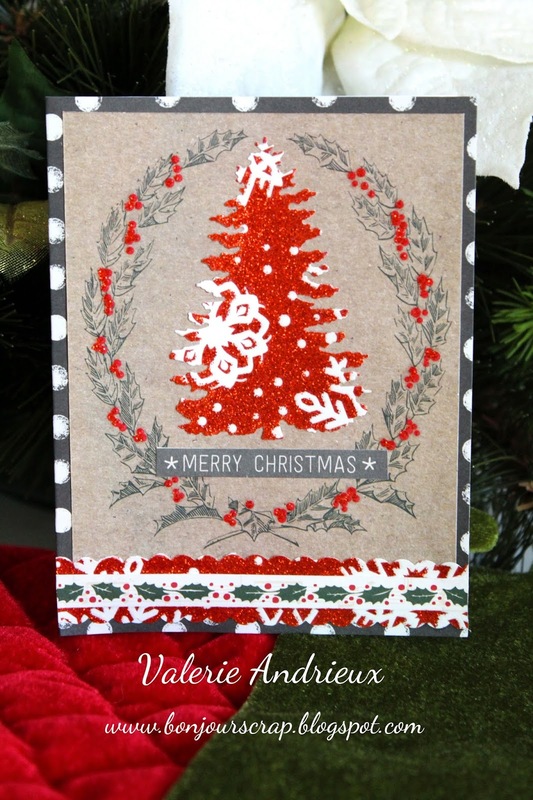 It's one of the Recollections Christmas paper pad you can find on super sale like always. This one is called North Pole Gazette. I even had enough papers to create more than 30 cards (maybe I will show more than one on some days...). 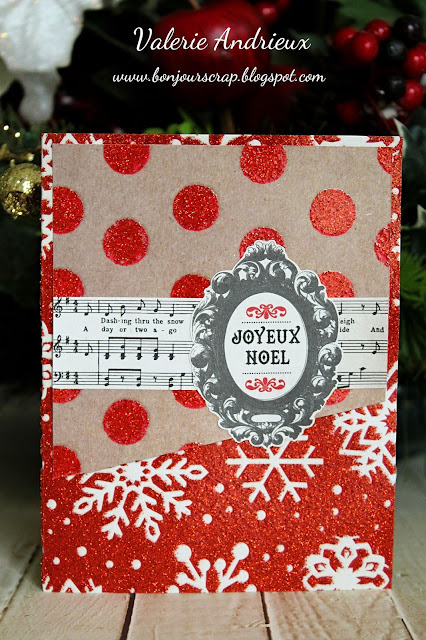 This first card is super simple, in unusual colors for Christmas but elegant. The paper is full of patterned papers, no plain color, and it's not always easy to create with this amount of patterns ! But you will see that I managed to mix them without difficult (or maybe just a little sometimes..). 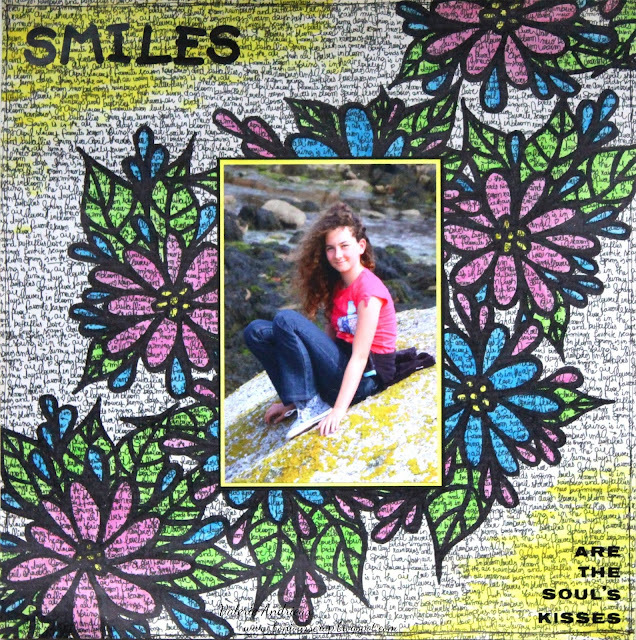 The base is a sheet cut into a 5 1/2" x 8 1/2" rectangle, folded in half. Two smaller rectangles, and two elements cut from another sheet, plus the deer square (was a countdown square, but I mask the number with the tag). I adhere everything with adhesive sheet. By the way, did you know that a 6x6 double sided adhesive sheet package of 5 is today's freebie at scrapbook.com, as well as a pack of 3 clear stackable daubers. Use the coupon code HOLIDAY2018 to receive $10 off any $70 order on top of exclusive sales up to 50% off. But hurry, today is the last day of this Scrapbook.com offer ! 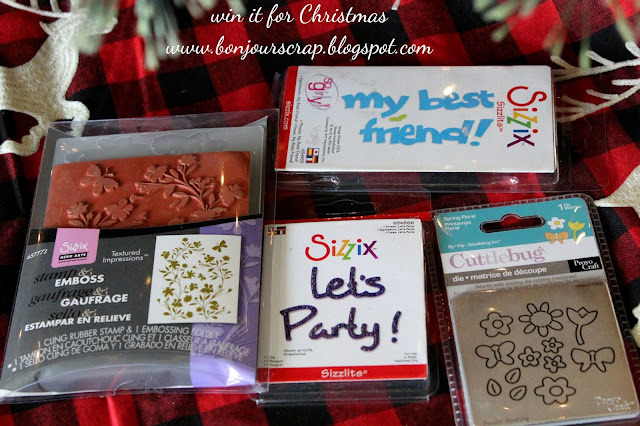 The winner will receive one Cuttlebug Spring floral die, two Sizzix phrase dies (let's party and my best friend!) 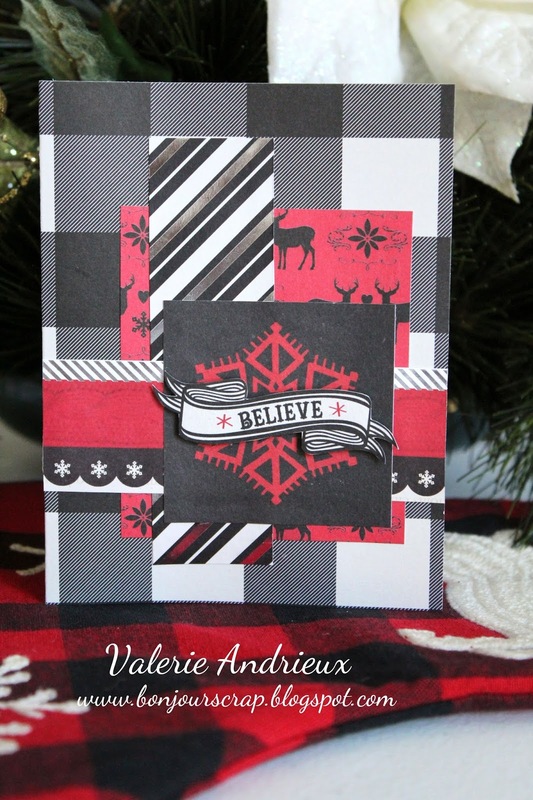 and one Stamp& Emboss set by Sizzix/Hero Arts (A2 cling rubber stamp and a matching embossing folder). Thank you for stopping by today. I hope to see you everyday from now, remember, each comment on each card will earn you a giveaway entry ! I started by spraying Timeless and Warm Colorations over the pages, stamp designs all around and add more colors with Poppy, Chocolate, Kenyan Copper and Leaf Sorbets. I also added a little of Gold Metal Effect to it. 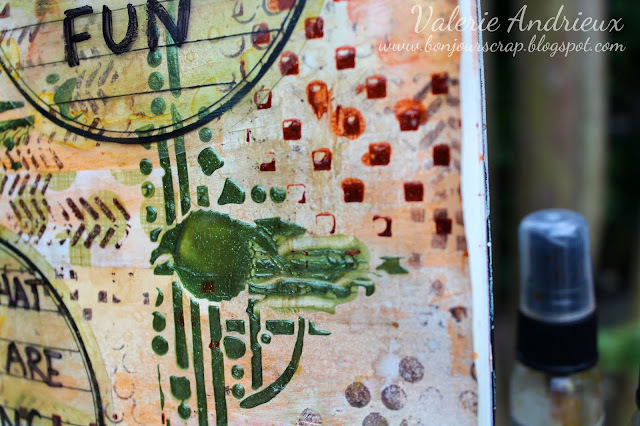 The stencils I used with the paints were Bits of Grunge and Blocked stencils by Art Anthology too. For my journaling I decided to use an acrylic journaling tag I added since forever in my stash, just panted nto in green and gold and write with a black Sharpie on it.